Eurocode 7 discusses three types of anchorage test: investigation, suitability, and acceptance. Investigation tests are performed, before working anchorages are installed, to establish the anchorage's ultimate pull-out resistance in the ground conditions at the site, to prove the contractor's competence, and to prove novel types of ground anchorage. Investigation tests should be carried out when anchorages have not previously been tested in similar ground conditions or if higher working loads than previously tested are anticipated. Eurocode 7 does not give any recommendations concerning the number of investigation tests that should be performed. However, the draft version of the standard10 suggested that at least 1% of temporary and 2% of permanent fwhich, due to differences in relative elasticity between the tendon and the grouted ground, produces progressive de-bonding within the bonded length. anchorages should undergo 'assessment' tests, a term that embraces both investigation and suitability tests. Anchorages used in investigation tests must not be incorporated into the permanent works if they have been loaded to failure. Since the test anchorages are subject to higher loads than working anchorages, their tendon size may need to be increased above that of the working anchorages. Alternatively, investigation tests may incorporate anchorages with shorter fixed lengths. Correction factors may also be applied to account for progressive de-bonding within the fixed anchor length. Figure 14.2 illustrates the relative magnitude of the tendon's tensile yield strength Ptk, its elastic limit load Pt0.1k, the maximum proof load Pp that should be applied, and the lock-off load P0. Suitability tests are normally carried out on a selected number of anchorages to confirm that a particular anchor design is adequate. Their intent is to examine creep characteristics, elastic extension behaviour, and load loss with time. Anchorages subjected to suitability tests may be used as working anchorages. At least three suitability tests should1 be performed on anchorages constructed under identical conditions to the working anchorages. P < 0 9P 1p-v-ylt 0.1,k where Pt01k is the tendon's characteristic tensile load at 0.1% strain. See Chapter 15 for a summary of the differences between Test Methods 1-3. 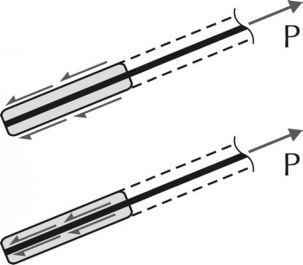 The requirement to limit the proof load Pp to 90-95% of the tendon's characteristic tensile load Pt0.1k conflicts with the requirement that Pp should be greater than or equal to the design resistance of the anchor Rd. This conflict arises because Rd is obtained by dividing the tendon's tensile strength Ptk by a partial factor Ya, which Eurocode 7 specifies as 1.1. Hence Rd is likely to be greater than 90-95% of Pt0.1k. Work is underway within CEN Technical Committees 250/SC7 and 288 to rectify this conflict. In the meantime, in order to prevent overstress of the f'shaH' in EN 1537.
anchor in suitability tests, we recommend that the proof load be limited to 90-95% of Pt0. 1k and is not based on Rd. 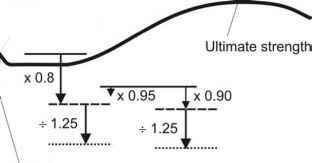 Figure 14.2 illustrates the relative magnitude of the tendon's tensile yield strength Pt,k, its elastic limit load Pt0.1,k, the maximum proof load Pp that should be applied, and the lock-off load P0. Acceptance tests must be carried out on all working anchorages to demonstrate that a proof load Pp can be sustained; to determine the apparent tendon free length; to ensure the lock-off load is at its design level; and to determine creep or load loss characteristics under serviceability conditions. 1.25Po < Pp < 0.9Pto.u or (for Test Method 3): Pp = 1.25P0 or Pp = Rd where P0 is the lock-off load, Pt0.1,k is the tendon's characteristic tensile load at 0.1% strain, and Rd is the required design resistance of the anchor. See Chapter 15 for a summary of the differences between Test Methods 1-3. This is likely to conflict with the requirement for Test Method 3 that the proof load Pp be at least equal to design resistance of the anchor Rd, since the latter is likely to be greater than 1.15 Pk,sls. Until this conflict is rectified, we recommend ignoring the requirement for the proof load to exceed the anchor's design resistance. • capacity of the anchor head. For anchorages not formed by grouting, e.g. 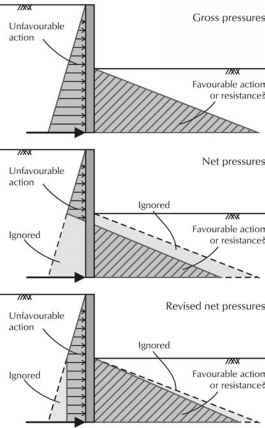 screw anchorages and rock bolts, it is not necessary to consider the internal resistance as this is covered by the tensile cap. During an anchorage test, failure will occur in the weakest element. Design based on testing does not identify which failure mode is involved. When the characteristic pull-out resistance Rak is obtained from investigation where Ra is the measured failure load and Pp the maximum proof load applied in the test. How to check for anchorage in structural design?